I tend to get distracted easily. squirrel! 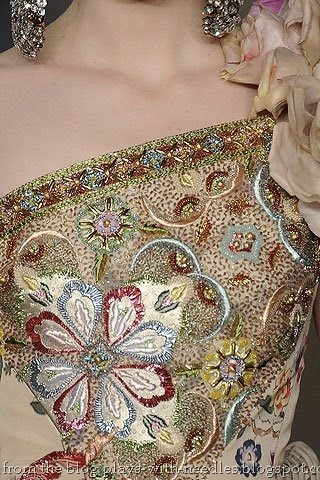 This week my distraction is couture embroidery, specifically bead and sequin work. It turns out that this is not really done by hand. Well, it is, but there is a technique and a tool that was developed in, of course, Paris. Specifically at the Lesage School where you can obtain a professional certificate. Tambour embroidery is worked on a frame, leaving both hands free. Similar to “punch needle” embroidery if you are familiar with that technique. The tambour needle pierces the fabric, the yarn is hooked onto it from below and the needle is place a little further away and then pierced through the fabric again. 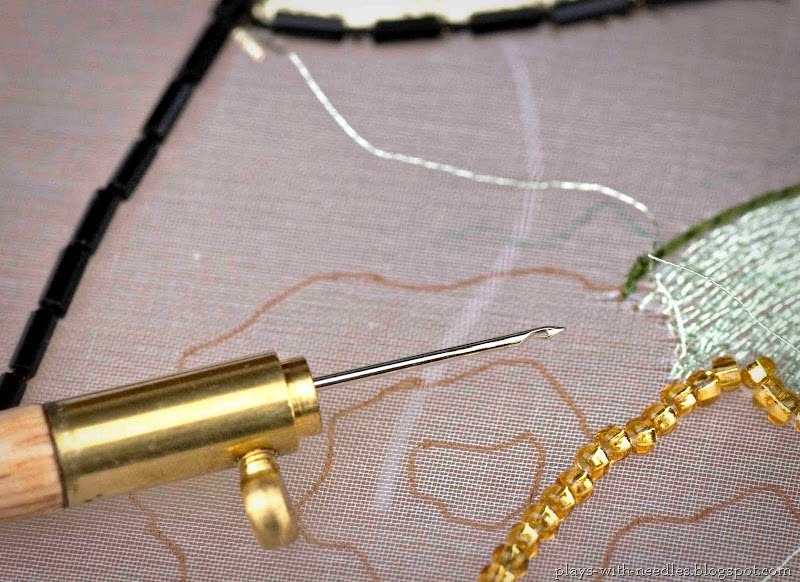 You can work either running stitch, a satin stitch or a chain stitch. If you are working with beads and/or sequins these are strung in bulk before hand and are worked onto the fabric in the same way. On the back of the fabric! That is why it is commonly done on sheer fabrics, with silk organza being preferred. On the BACK of the fabric. Tambour frames are made so that you can switch back and forth between the front and the back of the fabric. There quite a few resources, blogs and supplies to be found on the intertubes. My favorite post so far, for it’s enthusiasm, pictures and links is from this blog, which I need to spend a bit more time on. She has supplied a number of great links including a video, which will be helpful when the needle I ordered last night arrives. As luck would have it, the current issue of Piecework magazine has a wonderful article on the history of tambour embroidery and beadwork, including the beautiful beaded gown on the front cover. There is also a project written by Robert Haven who seems to be the go-to guy for all things tambour, outside of Paris. I love the instructions, “make the 1st 3 chain stitches back and forth exceptionally tiny, less than 1/32 of an inch.” That’s my kind of crafting!! To quote the article, Le premier million de points sont les plus difficiles! or, The first million stitches are the most difficult!